With modern attention focused on the need for management of public-sector costs, the selection of roofing and waterproofing materials is a vital consideration in providing durability and low-cost maintenance. Mastic asphalt is the material of choice for many public structures which require long life, guaranteed waterproofing and maintainability due to its dependable qualities. This is particularly true as mastic asphalt is highly versatile, and can be laid over flat, curved or sloped surfaces to offer outstanding waterproof protection to even the most ambitious concepts. Once laid, the membrane promises to outlast the substrate - often in excess of half a century. At the end of its design life, the membrane is totally recyclable, yet another positive quality of using this specific material. However, the choice is yours, as some of our customers have successfully installed built-up felt roofing or single-ply roofing to meet their particular needs. Whatever your choice, PMA has an outstanding reputation for dependable and professional workmanship and products or the highest of standards, as well as guaranteeing products of the highest quality at rates that are both extremely reasonable and competitive. 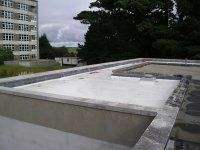 So, when you need assistance with roof maintenance in Plymouth or throughout Cornwall remember to get in touch with Premier Mastic Asphalt, where we have vast experience and knowledge in all manners of roofing. Don't hesitate to get in touch if you have any questions or queries in regards to the materials or process and we will be happy to help in any way that we can.